Our tray slides are an excellent product used by industry professionals. 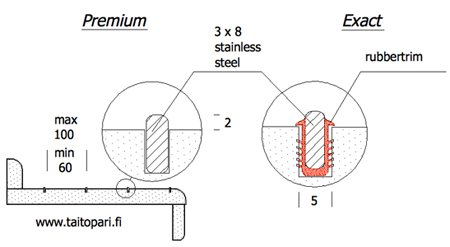 We have been producing these stainless steel rails in Finland for more than 10 years. We supply the tray slides fast, directly from our stock, using our cost-efficient distribution network. It is possible to order specifically the amount and length of tray slides needed. Tray slides might be a small detail, but they really make a difference. Often the tray slides are ugly, made of bad quality plastic or steel that make them unsafe, unsustainable and non-functional.Our tray slides provide the solution: they do not only look great, but are also functional and meet the technical requirements. Our tray slides make the slide area clean and hygienic. The tray slides have a soft profile and do not damage the trays. The trays are completely safe for people using them. The rails are slim and do not penetrate the counter top material. This makes the tray slides firm. The tray slide is straight but can be bended flexibly, enabling clean extensions. It is possible to choose from our two models, Premium and Exact, according to your needs. This is our basic tray slide option. These stainless steel tray slides are the most reasonably priced option if specific features are not required. This is our customisable tray slide option. These high-quality stainless steel rails have been equipped with special rubber seal and thus make it a quality, clean and sustainable solution for more sophisticated applications. It is possible to customise the slides with coloured rubber seals. This can create a stylised effect on your counter. When used in stairs, the coloured rails provide additional safety. The rubber seal protects the slide structure from humidity and bacteria. The rubber seal is available in food safety quality and in all RAL colour, including transparent. The rubber seal is made of recyclable thermoplastic elastomer. This material is highly resistant against chemicals and weather effects and endures temperatures ranging from -50 to +120°C. The rubber seals cover any possible milling cracks. The seals can be exchanged without any damage to the surrounding structures. Wear-resistant and easy to affix! Length: 3-4m. It is also possible to order rails in customised lengths.